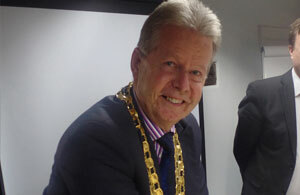 Councillor Nigel Coltman has been elected Town Mayor and Chairman of Hailsham Town Council for 2015/16 at the Council’s Annual General Meeting held on Wednesday [20 May]. Councillor Coltman was elected onto the Town Council in 1999 and has served on a number of committees, and was Chairman of the Council’s Business Enterprise Committee from May 2011 to May 2015. Councillor Coltman and his wife Sandra moved to Hailsham in 1977. Their four sons have all been educated in Hailsham schools, and are now successfully employed. He has been active in the community through church choral and theatrical presentations at the community hall and is a life member and supporter of the Hailsham Pavilion. Councillor Coltman was also Chairman of the Hailsham Forward Stakeholder Group, which grew out of Hailsham’s application for a Portas Grant, and over the coming year he expects to see some visible projects to enhance the image of the town. His long term vision is for a town that is more ‘people focused’, and is working towards a refreshed town centre that will become an attractive focus for the growing population. “It’s an absolute honour to be elected Mayor of this wonderful and diverse town,” Councillor Coltman said. ” I would like to thank my colleagues for nominating me for this important role. With the post comes the responsibility of acting as ambassador to the people of Hailsham, which I will undertake in a positive way and to the best of my abilities on behalf of all the residents. Councillor Amanda O’ Rawe, who was first elected on to the Council in May 2011 representing Hailsham South & West Ward, has taken on the role of Deputy Town Mayor and Vice-Chairman for 2015/16.